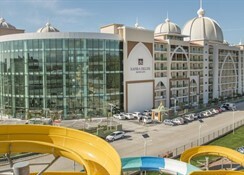 Xafira Deluxe Resort is an all-inclusive, family friendly resort nestled in the scenic resort of Turkler, Antalya. Guests can take a refreshing dip at any of the two outdoor swimming pools or an indoor pool. With well-appointed 800 guestrooms in contemporary furnishing and all modern amenities, this is the perfect accommodation choice on a lovely private beach to spend a fun-filled holiday. With its four restaurants and two poolside bars and a full-service spa this is a top choice of travelers travelling solo, as a couple or family. Explore the sights of Turkler in unmatched comfort when you check into this property and relax amidst its warm hospitality. 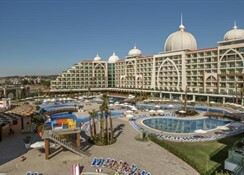 Xafira Deluxe Resort is located on a lovely beachfront on in the scenic resort of Turkler, Antalya. The hotel is 10km from the Konakli Clock Tower Square, and 6.5km from the Sarapsa Hani Fortress. 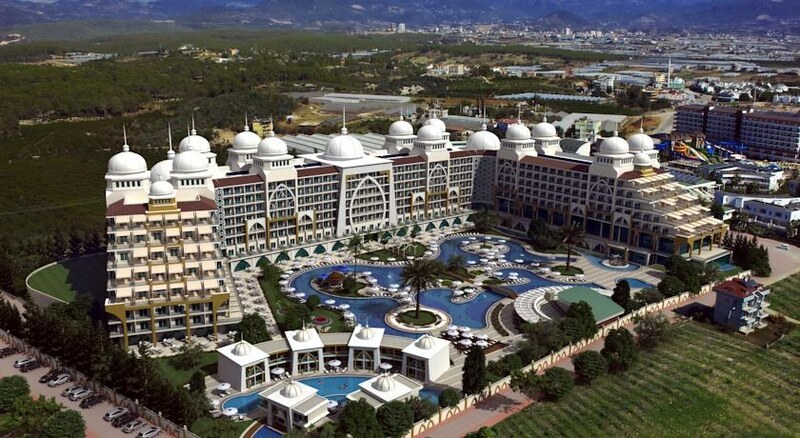 The Gazipasa Airport is 61km, while the Antalya international airport is 106km from the property. Located on Turkey’s southern coastline, barely a 25-minute drive from Alanya, the unique town of Turkler is a laidback beach resort. The region is known for its fine beaches and breathtaking scenery. An all-year warm sunshine and the serene, secluded atmosphere of the town makes it popular with tourists. The Xafira Deluxe Resort offers a total of 800 well-appointed guestrooms. All rooms at the Xafira Deluxe Resort come with central air conditioning, laminated flooring, electronic door cards, a 40’’ LCD satellite TV, Radio via TV, direct telephone, special bathroom accessories, hair dryer, WC, bathroom phone and safe. The smoke free rooms have attached balconies which provide excellent views of the surroundings. Daily room cleaning, towel change is provided. A crib can be provided on request. 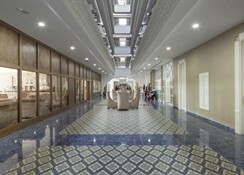 Rooms at the hotel come in types of superior standard, superior family, villa family and king suite. Xafira Deluxe Resort has a main restaurant that serves open buffet for breakfast, late breakfast, lunch, dinner and midnight buffet. Watch expert chefs serving up delicious local and international cuisines from the freshest of ingredients. Guests can also relax at two lovely pool bars while soaking up the sun. There are several a la carte restaurants serving a wide variety of local and international cuisine. There is a snack bar and a patisserie that offers delicious pastries in the evening. Xafira Deluxe Resort has a swimming pool and a separate children’s pool and terrace where guests can soak up the sun. 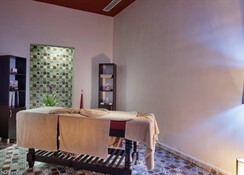 There is a lovely spa with sauna offering massages and therapies. Tiny tots can have fun at kid’s club, waterslides or playground. Loved the place even though we has few issues with teletext holidays. Everything is povided except iron which was a pitty. I stayed at the Hotel in May 2018. The hotel it's self is generally a 4 star hotel. The rooms are spacious and comfortable. There aren't any tea/coffee facilities and the drinks aren't replenished everyday, also if you enjoy watching TV in the evenings British programs are limited. The resturants offer good food with plenty of variety, the novelty restaurant isn't fantastic but quite nice if you decide to take the family or go as a group. The service in the general restaurant is not great so expect to find your own drinks. Entertainment during the day is plentiful and the team make every effort to ensure that people can interact within the program. 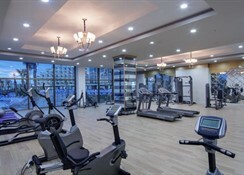 The Gym is not fantastic and much of the equipment is broken so if you like the gym you may consider joining one outside of the resort. 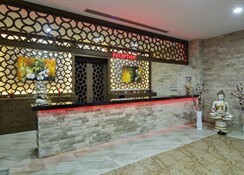 The Spa is very nice and worth a visit, the prices are competitive.